The southern Chinese seaport of Quanzhou in Fujian province is home to Kaiyuan Temple (開元寺), also known as the Purple Cloud Temple (Ziyun si, 紫雲寺), an ancient Buddhist complex originally built in 686. The temple is famous for its two stone pagodas, each of which is covered in 80 lifesize relief carvings of bodhisattvas, arhats, patriarchs, protector deities, and various mythological creatures rendered in a rustic style influenced by the Northern Song Dynasty school of art (Ecke & Demiéville, 1935, pp. 11-18). One figure of interest is a muscular, sword-wielding, monkey-headed warrior (fig. 1) located on the northeastern side of the western pagoda’s fourth story. Many scholars consider this to be an early depiction of Sun Wukong from Journey to the West (1592). The pagoda was erected in 1237 (Ecke & Demiéville, 1935, p. 91), so this depiction predates the ming novel by 355 years, making it an important source for analazying the early influences on the much beloved literary character. In this paper, I present past research on the relief, as well my own in which I suggest the iconography is based on ritual adornments mentioned in the Hevajra Tantra, an Esoteric Buddhist text of the 8th-century. Fig. 1 – The Kaiyuan temple pagoda relief (larger version), Quanzhou, Fujian . The first detailed description of the relief appears in Ecke and Demiéville (1935). 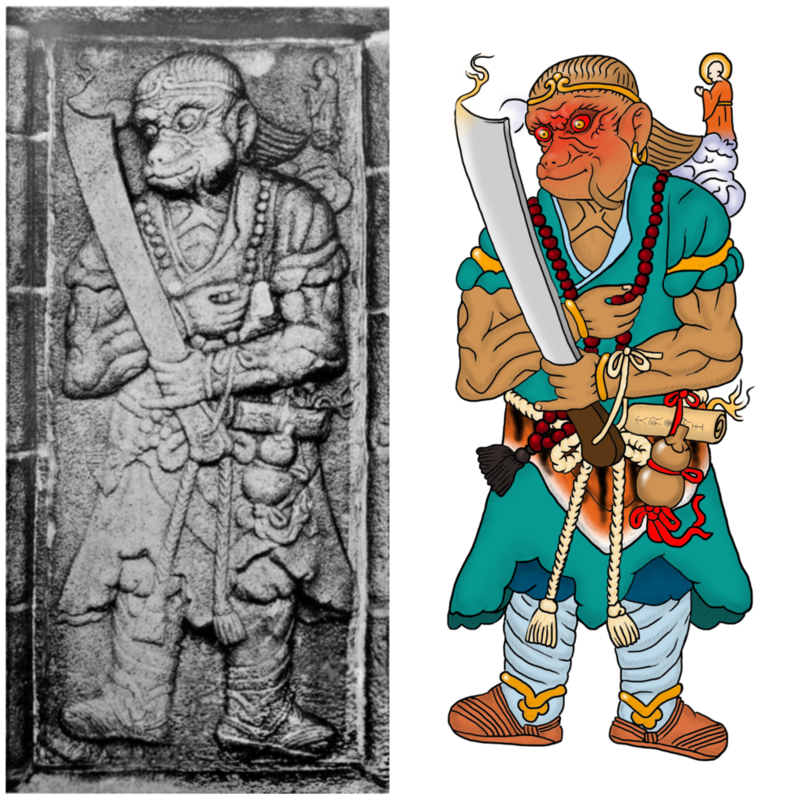 Glen Dudbridge (1970) compares Ecke and Demiéville’s analysis with the description of the Monkey Pilgrim (Hou xinzhe, 猴行者) from the Master of the Law, the 13th-century precursor of Journey to the West. Based on the differences, he suggests Northern and Southern China may have had separate Monkey story cycles. [T]here is no sign there of the traveller’s garb in which the Zayton  figure is so meticulously clothed; the sword is also not mentioned, although the ‘iron rod with gold rings’ … has not yet assumed its full distinctive role; similarly, the tiger-skin robe, while not described in so many words, seems faintly anticipated in the episode [chapter six] in which Hou Hsing-che slays a tiger-demon, and certainly this standard attribute of demonic figures in Tantric iconography accords well with the description of the yakṣa in that same episode. All this tends to suggest that the Zayton monkey-figure remains strangely distinct from that known to us in the literary sources … Certainly at this stage of their development, there seems to have been no obligation to uniformity in the enactment or representation of popular story cycles: the monkey seen, heard or read about by the northern public could well have differed from his southern counterpart (p. 49). Writing in 1977, Journey to the West translator and scholar Anthony C. Yu highlighted a difference in opinion regarding the pious figure on the upper right of the piece. Ōta Tatsuo 太田辰夫 and Torii Hisayasu 鳥居久靖, in “Kaisetsu 解説,” in Saiyuki, Chūgoku koten bungaku taikei, 31-32 (Tokyo 1971), 432, have challenged Ecke and Demiéville’s interpretation of the carving by pointing out that the figure at the upper righthand corner should be thought of simply as a figure of Buddha (not Hsüan-tsang), which Monkey will become by virtue of bringing back the scriptures. It may be added that Sun Wu-k’ung of the hundred chapter narrative did use a sword or scimitar 刀 (JW, chaps. 2 and 3) before he acquired his famous rod. None of the scholars consulted here sees fit to discuss the significance of what seems to be a headband worn by the carved figure (Wu & Yu, 1977, p. 497 n. 23). Victor Mair (1989) focuses on the relief’s iconography and suggests the various elements might have ties to depictions of both the Buddhist protector deity Aṇḍīra and the Hindu monkey god Hanuman from the Ramayana (c. 4th-cent BCE). The band on the Zayton monkey’s head is indeed very important. Surely it must represent what becomes the Tight-Fillet 緊箍 of the Ming JW, ch. 14. Regardless of the author’s (or his predecessors’) elaborate creative inventions surrounding this fillet in the tradition of the novel, we may ask whether it has any identifiable iconographical origins in art. The Tight-Fillet recalls the band around the head of representations of Aṇḍīra, the simian guardian of Avalokiteśvara and Bhaișajyaguruvaidūryaprabhāṣa … As a typical specimen, we may take a statue [fig. 2] from the Kōfukuji in Nara. The Kōfukuji Aṇḍīra has curious wing-like projections extending from the sides of the band around his head that remind us of Mercury in Western classical art. On the Zayton SWK [Sun Wukong], these symbols of swiftness have been displaced to the sides of the eyes. 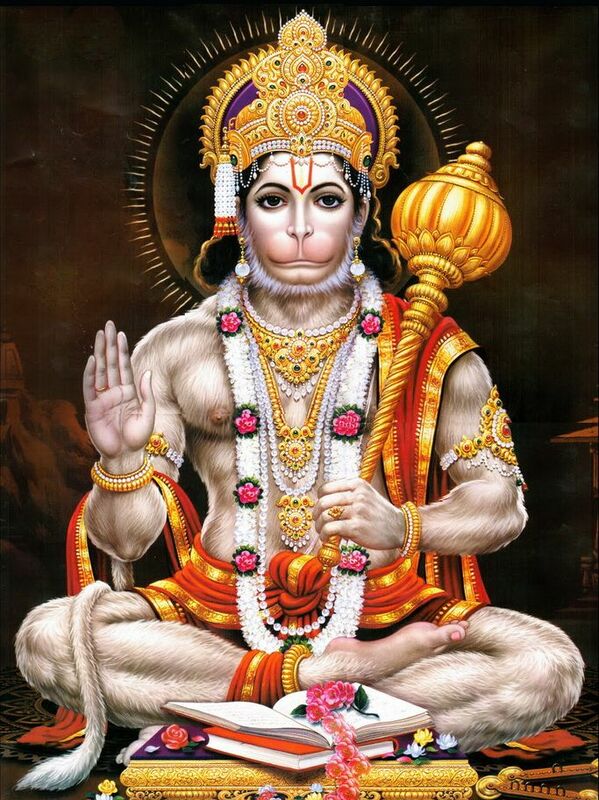 In either case, the wings remind us of H’s [Hanuman’s] descent from the god of the wind. Other similarities between the Kōfukuji Aṇḍīra and the Zayton SWK include: identical earrings (these are key iconographical features of H in many Southeast Asian Rs [Ramayanas]), comparable tilt of the head (exaggerated with the Kōfukuji Aṇḍīra) which seems to indicate enforced submission, long locks of hair flaring out behind the head, elongated monkey’s mouth, similar decorations on forearms and upper arm, etc. It is crucial to note that all of these features can be found in South Asian and Southeast Asian representations of H. For its photographic clarity, we may choose a scene from the Rāma reliefs in Panataran, Indonesia [fig. 3]. H’s forearms are bare in this particular representation, but in some Thai reliefs (at Wat Phra Jetubon in Bangkok), they resemble those of the Zayton SWK and the Kōfukuji Aṇḍīra. The discrepancies in the dress and ornamentation of the lower parts of the body may be attributed to culture and climate (pp. 699-700). Fig. 2 – The Kōfukuji Aṇḍīra wooden relief carving (c. 11th to 12th-cent.) (larger version), Nara, Japan. Fig. 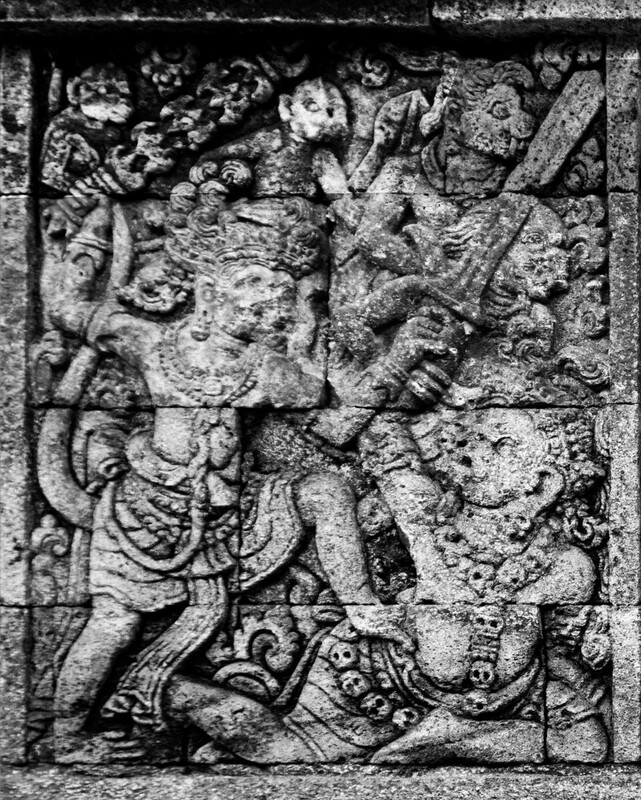 3 – Hanuman (left) besting a demonic foe (right), from the Ramayana reliefs of the Panataran temple complex (c. 12th-cent.) (larger version), East Java, Indonesia. My opinion on the origins of the Kaiyuan relief’s iconography parts ways with Mair in some respects. For instance, upon close inspection of the Japanese Aṇḍīra carving, the band that he refers to appears to be the brim of a helmet, and the “symbols of swiftness” transferred to our relief are simply wrinkles on Monkey’s face. I do agree the Kaiyuan relief shares affinities with the cited image of Hanuman (e.g., the earrings and armbands). But again, here I part ways with Mair because I suggest the relief’s accoutrements were instead influenced by Esoteric Buddhism and not Hinduism. The similar imagery is no doubt due to a common cultural source. Nearly every aspect of Sun Wukong’s attire can be found in a passage from the 8th-century esoteric text the Hevajra Tantra (Dabei kongzhi jingang dajiao wang yigui jing, 大悲空智金剛大教王儀軌經). It instructs yogins on how to adorn and dress themselves for worshipping Heruka (Xi lu jia, 呬嚕迦), a wrathful protector deity of Buddhism. Translation: The practitioner should wear divine ear-rings, a circlet around the head, upon each wrist a bracelet, a girdle around his waist, anklets around the ankles, arm ornaments around the upper arms and a garland of bones around the neck. His dress must be of tiger skin and his food the Five Nectars (Farrow & Menon, 2001, pp. 61-62). Earrings? Check! Circlet? Check! Bracelets, girdle, anklets, and arm ornaments? Check, check, check, and check! The only two aspects that are questionable are the bone necklace and the tigerskin. Rosaries are sometimes made from bone, which satisfies that requirement. As for the skin, while Ecke and Demiéville were quick to note its omission in their study, I think the appearance of so many elements from the passage suggests the tigerskin is present but the features may have just been eroded by time. The chevron shape visible below the girdle could be a skin apron. I’ve created a color version of the relief based on this information (fig. 4). Fig. 4 – My interpretation of the relief (larger version). A comparison of the original and new versions can be seen here. As I explained in a previous article, the Hevajra Tantra was officially translated into Chinese in 1055 (no doubt arriving earlier than this), so the text was present in the middle kingdom for nearly 200 years prior to the creation of the relief. What can these ritual elements tell us about Monkey’s depiction? Firstly, it should be noted that the esoteric deity Heruka and other such wrathful guardians, known as “Wrathful Destroyers of Obstacles” (Sk: krodha-vighnantaka), are commonly portrayed wearing such items, leading to the scholar Van Kooij to comment, “Heruka is more or less a deified hypostasis of the … yogin himself” (Linrothe, 1999, p. 251). Second, these deities are often portrayed wielding weapons. For example, one source describes Vajrapani‘s wrathful form Trailokyavijaya “hold[ing] the vajra, ankusa-hook, sharp sword, pâsa-noose and other âyudha [weapons]” (Linrothe, 1999, p. 188). Sun Wukong too is depicted with a weapon, a sword with a lick of heavenly flame. Third, the flaming sutra tied to Monkey’s girdle was, as explained above, historically “used as a charm against all calamities, dangers, wounds, and diseases.” Wrathful Destroyers of Obstacles are charged “with the destruction of barriers which prevent the experience of enlightenment” (Linrothe, 1999, p. 25). These include external threats like manifested demons and internal threats like demon-caused mental and bodily illness, the “three poisons”, and karmic debt (Linrothe, 1999, pp. 24-25). Therefore, the iconography presents Sun Wukong as a wrathful protector deity. This then may lend support to Ecke and Demiéville’s original assertion that the pious figure floating in the clouds to the right of Monkey’s head is in fact Xuanzang. The Great Sage clears the path of manifested demons that obstruct the monk’s path to enlightenment, leading to his ascension into paradise (this happens in both the 13th-century version of the story and the final Ming novel). The 13th-century Sun Wukong pagoda relief of the Kaiyuan Temple shares many similarities to ritual adornments mentioned in the esoteric Hevajra Tantra (8th-cent. ), including earrings, the circlet, arm cuffs, a necklace, a girdle, wrist bangles, anklets, and possibly even a tiger skin. Esoteric protector deities are often portrayed with similar attire since they represent the very yogin ascetics who worship them. Monkey’s depiction with said attire suggests the artist who created the piece intended to present him as a powerful Buddhist guardian on par with Wrathful Destroyers of Obstacles like Heruka. The depicted sword and sutra, each shown with a lick of heavenly flame, no doubt represent the means by which the Great Sage protects his master Xuanzang (possibly the pious figure on the upper right corner of the relief). While Monkey’s association with the fillet and the tiger skin carried over into the novel, other characters came to be associated with ritual adornments from the Hevajra Tantra. A prime example is Red Boy (Hong hai’er, 紅孩兒), son of the Bull Demon King and Lady Iron Fan. The Bodhisattva Guanyin forces the demon child to submit in chapter 42, after which she uses a magic treasure given to her by the Buddha to ensnare his extremities. Dear Bodhisattva! She took the fillet and waved it at the wind once, crying, “Change!” It changed into five fillets, which she threw at the body of the boy, crying, “Hit!” One fillet enveloped the boy’s head, while the rest caught his two hands and two feet (Wu & Yu, 1977, vol. 2, p. 280). Red Boy is the literary counterpart of the religious figure Sudhana (Sancai, 善財), whose spiritual journey is told in the Gandavyuha Sutra (Dafang guang fohuayan jing, 大方廣佛華嚴經, c. 3rd-cent.). The youth sets out on a quest towards enlightenment and trains under 52 different teachers, including Maitreya, Avalokiteśvara (the South Asian variant of Guanyin), Mañjuśrī, and Samantabhadra (Buswell & Lopez, 2013, p. 864). It’s no wonder then that the ascetic came to be associated with such ritual adornments. South and East Asian depictions of Sudhana/Sancai often portray him wearing bangles and anklets (fig. 5). Fig. 5 – A modern day altar statue of Sudhana/Sancai (larger version). Notice the bangles and anklets. 1) Yu is referring to the fight between Sun wukong and a demon, during which time the monkey disarms him and uses the latter’s own sword against him. 2) The city of Quanzhou was known to both Marco Polo and Ibn Battuta by the Arabic name Zayton or Zaiton (زيتون , the “City of Olives”). 3) Monkey transforms a ringed monk’s staff into a titanic yakṣa that crushes the aforementioned tiger demon with a club. Buswell, R. E., & Lopez, D. S. (2013). The Princeton dictionary of Buddhism. Princeton, NJ : Princeton University Press. Dudbridge, G. (1970). The Hsi-yu chi: A study of antecedents to the sixteenth-century Chinese novel. Cambridge: Cambridge Univ. Press. Ecke, G., & Demiéville, P. (1935). The twin pagodas of Zayton: A study of the later Buddhist sculpture in China. Cambridge, Mass: Harvard University Press. Farrow, G. W., & Menon, I. (2001). The concealed essence of the Hevajra Tantra: With the commentary Yogaratnamālā. Delhi: Motilal Banarsidass Publ. Linrothe, R. N. (1999). Ruthless compassion: wrathful deities in early Indo-Tibetan esoteric Buddhist art. Boston, Mass: Shambhala. Wu, C., & Yu, A. C. (1977). The journey to the West. Volume 1. Chicago, Illinois : University of Chicago Press.